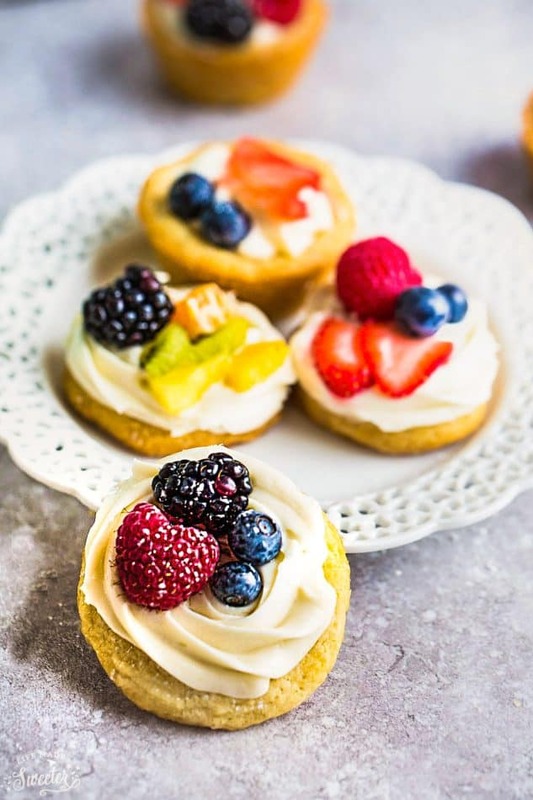 Mini Fruit Pizza – a classic dessert made using homemade soft sugar cookies topped with fresh fruit. Perfect for barbecues, potlucks and parties. Disclosure: This is a sponsored post created in partnership with KitchenAid. Now that spring is here, I love that I’m starting to see tons of fresh fruit showing up again. 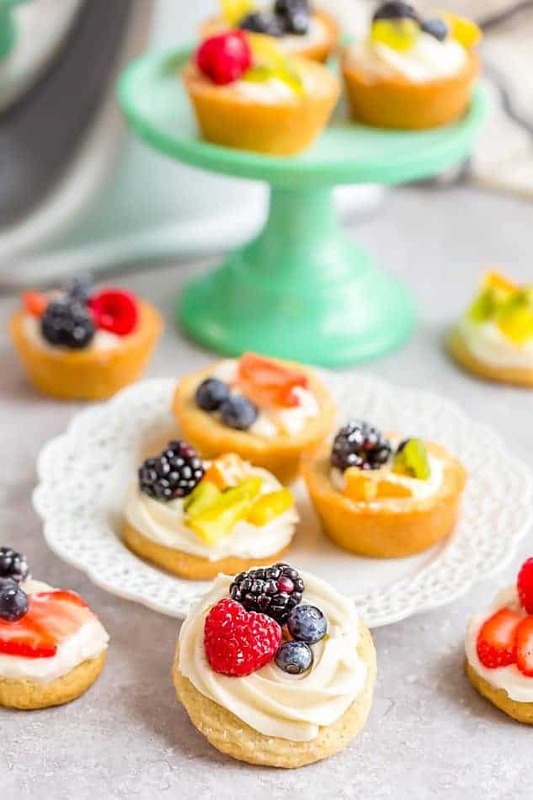 In case you were looking for some lighter dessert options for Easter this weekend or Mother’s Day next month, these Mini Fruit Pizzas would make a great addition to your menu. Mini desserts are my favorite since they are just so darn cute! Plus they are the perfect size to bring to parties or even just to eat by yourself. 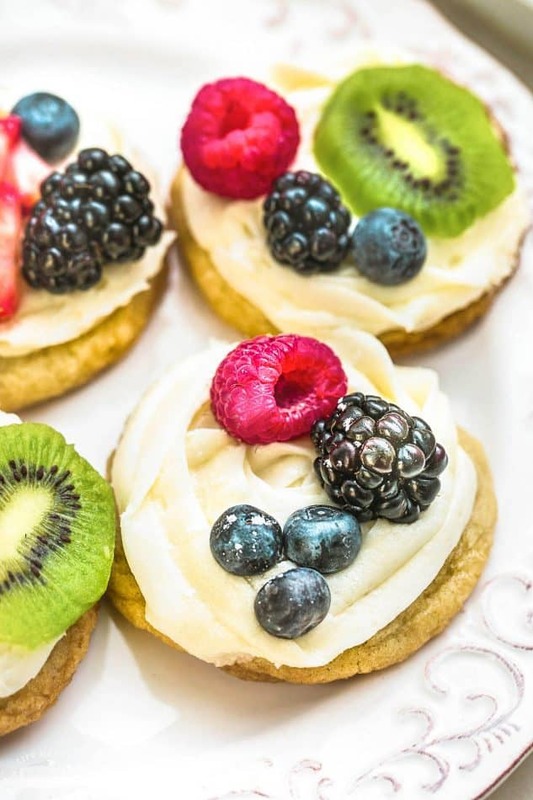 This Mini Fruit Pizza recipe starts off with a simple soft sugar cookie dough. It’s made with just butter, sugar, vanilla, flour, baking powder and some salt. The key ingredient to keeping these cookies nice and soft is by adding a touch of corn starch. Once the dough comes together, roll out the cookie dough balls onto a baking tray. The cookies don’t spread too much so you’ll need to flatten them slightly with the back of a spoon or a small glass. Bake in the oven for 8-9 minutes or until the cookies are lightly brown on the edges. Cool for 5 minutes before transferring onto a wire rack to cool completely. While the cookies are cooling, you can whip up the homemade coconut cream cheese frosting and slice up some fruit for the topping. Use any variety you like to give it some beautiful and bright colors. 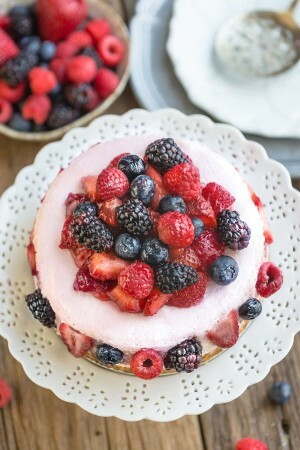 Fruit Pizzas make great desserts at any time of year but are especially perfect for spring and summer celebrations. 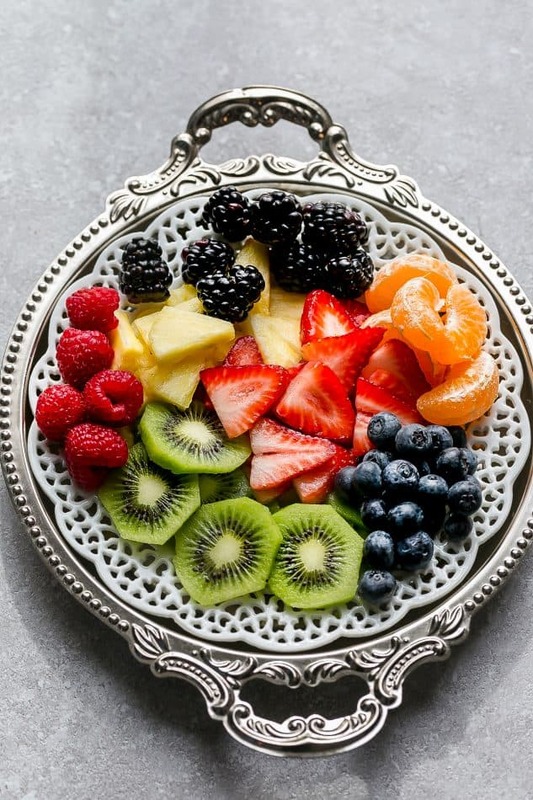 Plus they are a great way to incorporate the colors of the rainbow into your diet. Bake the cookies the day before and store in an air-tight container at room-temperature. Make the cream cheese frosting the day before and store in an air-tight container in the fridge. In the morning, just smear or pipe onto the cookies. Be sure to head over to The KitchenAid Blog where I share the full recipe along with 2 other Mini Spring desserts. 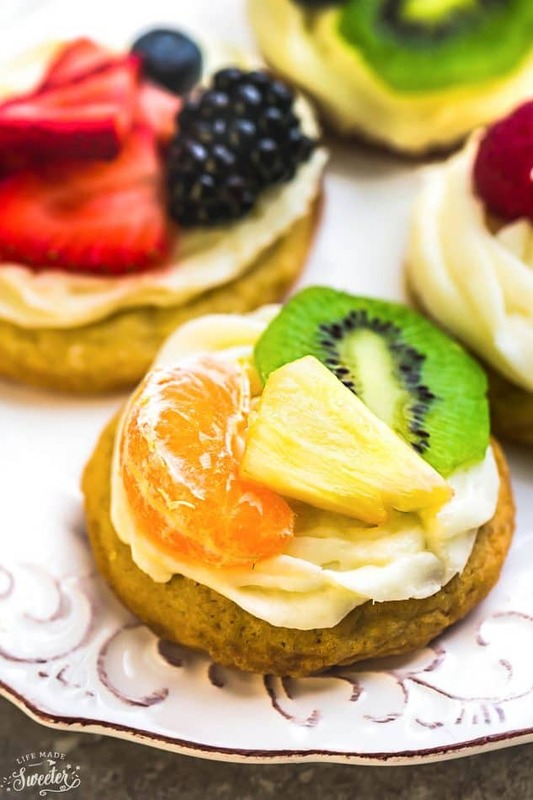 Mini Fruit Pizza - a classic dessert made using homemade soft sugar cookies topped with fresh fruit. Perfect for barbecues, potlucks and parties. Preheat the oven to 350° F. Line two baking sheets with parchment paper and set aside. In the bowl of your KitchenAid® Stand Mixer, fitted with the flat beater, beat the butter and sugar on medium-high speed until nice and fluffy. Add the vanilla and egg until well combined, scraping down the bowl with a silicone spatula. 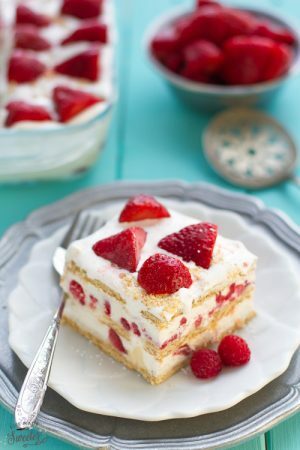 Head over to The KitchenAid Blog where I share the rest of the directions plus 2 more other mini spring desserts.